Since Mum and I are going through her house and looking at old things and decluttering I thought it might be fun to show off some crafting things we find, so here is a new series of old crafting things. I wanted to show you one of my most loved things from my childhood, my doll, Lise, she was given to me one my first birthday I think, and on this picture she is wearing a dress my grandmother knitted, there used to be socks and a hairband in the same colour as the purse but I am not sure where they are. 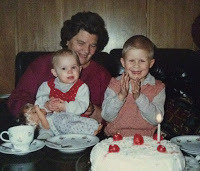 I have shown this picture of my grandmother, my brother and me on my first birthday before, I have also talked a bit about my grandmother in V for vintage. 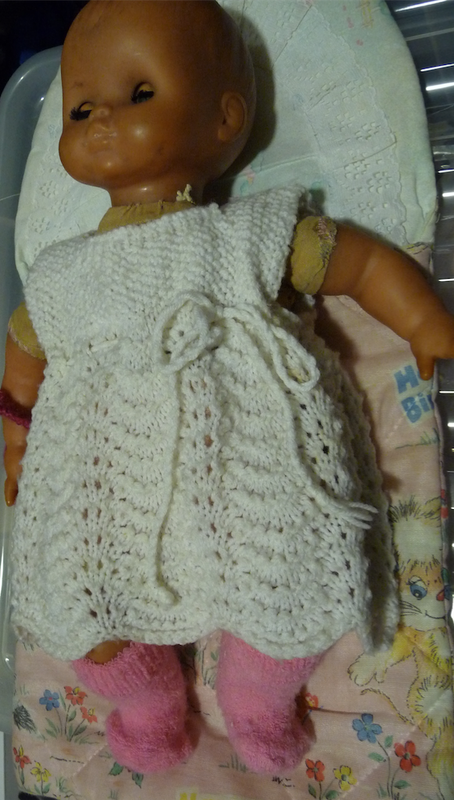 I loved my grandmother, she didn't really knit that much in her later years but she did make me that treasured doll dress. My mother has also told me that my grandmother was not a very good knitter initially because that was not something her family did, but as an adult she learned and became better and so I feel inspired to continue on my knitting journey even if crochet is easier and more fun for me. The pattern is called a mermaids foam in Norwegian I think my mother said and I so want to learn to make this pattern. Valmin is still sick, but a lot better, here he is eating of the floor and having a cuddle with Mimle. We went to the regular vet today and got some more painkillers and a thorough exam, his teeth are a bit pointy so we will address that later, and the gas in his tummy is a LOT better. We still don't know why he stopped eating but when buns stop eating their tummies get worse and gas builds up and they get a bad tumyache and then they will refuse to eat so painkillers are good. Valmin is eating more but we still give him supplements since he is still not a good eater yet. Mimle is ecstatic because the house is full of tasty food to entice Valmin to eat and Mimle is stuffing herself. So we have not given her more than a couple of pellets a day, she does not seem to mind, Critical Care is her favourite food and herbs and alfalfa hay come in at a close second. I am making something fun from the gacha stitches pattern Harens Saganatt (coming soon).